Q.: What is the Great Russia for you? Or do you prefer reasoning in terms other than these? D. MEDVEDEV: I don’t quite like pompous speculations. I believe it’s important for an official, the more so someone holding constitutional jobs, to renounce pomp. One should do concrete business. But I have a personal attitude to this. Without any doubt, Russia is a great country. First, we are really great by virtue of our history and our territory. It’s very difficult, for example, to describe a state as great, if it came into being 10 years ago and measures 1,000 square kilometres. But a country with a 1,000-year-long history and occupying one-sixth of the global landmass can only be great by definition, both in the direct and figurative sense of the word. Second, one mustn’t glorify this greatness. One must understand what a complicated world it is that we live in and what a complex country Russia is – precisely by virtue of Russia being very big territorially and rather big in terms of population numbers. It’ll always be more difficult to govern a country like Russia than other countries. Even if we go over to the most advanced technologies. We understand that some decisions will have to be put into practice physically – by legwork, lorries, or planes, by negotiating our difficult roads – even if we can have the use of digital communications and a global communications environment. And it is clear how important infrastructure is in our country. As any normal Russian, I love my country. I love its history, I love the special spiritual world that is connected with our life. But it’s rather an intimate thing. I believe that this should be somewhere deep down. If a person is a normal citizen, he has a duty to love his country, for otherwise one cannot live in a State. But this must never be emphasised, for otherwise a sensation of insincerity grows right away. Q.: How do you understand democracy? What is it all about? In particular, Russian democracy and the world experience vary on this score. And, in general, is there a need for any special Russian democracy? D. MEDVEDEV: A special Russian democracy… The thing is how it should be understood. I believed and continue to believe that our democracy is still very young. This is first. Attempts to present things differently are not serious at the least. Our democracy is developing in accordance with its own laws. We’ll be able to estimate the results some 30-50 years later, as it usually happens in history. Second, Democracy is a universal value; there is no doubt about it. It’s a system of state governance based on the representation of interests, on such a model of governmental behaviour which makes the authorities obey the people’s dictated expression in this or that form. But at the same time, each democracy is, of course, absolutely historical and absolutely national. The most difficult thing is possibly the interconnection between the universal nature of the democratic form and the national historical component proper. The priority of either, as I see it, is a dangerous thing. When someone says there is a set of dogmatic democratic values which you must follow, and if you retreat from them by even a pace, you are already a black sheep, you do the wrong things, and we’ll put you on trial for this – I don’t like it. Neither do I like certain other things. For example, when someone says that the degree of Russia’s specificity, of its history, is such as to incapacitate any universal values, any universal forms of State governance, any forms of civilised societal organisation. And we, therefore, must simply move forward for a rendezvous with our originality. I think it is cunning. In both I see just a wish to solve some of their own problems. Either geopolitical problems, when this is discussed by representatives of foreign states. Or domestic problems, when our home-spun politicians say that Russia is not yet ready for democracy. I said it time and again: I am not convinced when some additional definitions are attached to the word “democracy.” I believe this simply makes the situation poorer in content. Even if it is understood full well that democracy is only possible in an absolutely sovereign state that has a constitution of its own, a supreme authority within, and an independent course without. Fine, eh? Fantastic sound! And it’s only the classical records, jazz records; when you close your eyes, you periodically have the sensation that you are in a concert-hall. The sound is so alive. Q: Private property. It’s a key notion. It cannot be said that in our country at the present moment it has become rooted with much success. What is your attitude? D. MEDVEDEV: Yes, a very important theme. We somehow stopped talking about it of late. Possibly it is worthwhile to revive a public discussion of this theme. In Russia, private property has a fate apart. While democracy in this country is twenty years old, private property is centuries-old. Look: an economy based on the capitalist system emerged here rather long ago. We know, too, when private property emerged. Much earlier. Yet there was no democracy. But these are the things that, as a rule, follow one another. The European countries, at least, developed that way. In late 19th century, many European States already had a developed system of private property and a developed set of democratic institutions. Here private property was certainly developing, but there was no democracy whatsoever. Because there was the autocracy. Next, both private property and democracy died. The process was crushed. Thus, the understanding of the value of private property here is absolutely below the level that should be in a developed state, in a developed society. This is why for many people, private property is still synonymous with fraud, hard life, exploitation of man by man. Amazingly, this is characteristic not only of the elder generations but also of the middle-aged people, and not only because they didn’t prove quite successful in the 1990s, but because there was no understanding of what private property was all about. People were captive to the illusion that all property was created by the state, regulated by the state, and should be owned by the state. It is common knowledge, however, that property rests on the delimitation of what is mine and what is yours. In its nature, each and every property can only be private. Q.: Marx used to say that the state was privately owned by bureaucracy. D. MEDVEDEV: I am speaking about some deeper-lying things. In its legal nature, property is a particular category because it delimitates the property of different persons – the state, the companies, the citizens. For legal purposes, even state property is private in relation to a separate citizen or a company. And it is defended in courts by the universal methods. If anything other is allowed, we may come to the foolish conclusion that each of us has the right to demand that a part of state property be set aside for him. The value of the right to private property needs to be popularised in our country. There was no private property in the narrow sense of the word during the Soviet period. Even the term “private” was bashfully replaced by “personal” property. But starting from the 1990s, private property became hostage to harsh reforms and revolutionary transformations that were in progress in the economy. I mean the privatisation that took place in this country and left a taste of monstrous injustice in the overwhelming majority of our people. As is to be regretted, this reflected on the attitude to private property. Because for many people, the results of private property and privatisation meant the same. Many people had the sensation that they had been robbed. We’ll have to overcome the emotional consequences of those events for years and years. Nevertheless, private property is an extremely important construction. It belongs to the fundamental set of human rights. If we fail to learn how to respect and defend it as they do all over the world, we’ll linger in backwardness and desolation. Q.: Dmitry Anatolyevich, what, in your view, are current attitudes to wealth? D. MEDVEDEV: People’s attitudes to wealth in this country are, on the one hand, the same as in the rest of the world. An ordinary person is suspicious of super-rich people and of rapid fortune-making. This is normal. But that is where the differences begin. While for an average European, a fortune-maker is not so much a suspicious individual that stole something from the State as an example for self-development, for a part of our people, he is an anti-hero. Any businessman is a person who stole something from you – this is present somewhere at the unconscious level. In our country, as God willed, private property was always peculiar. Historically the collective element in attitudes to things, to land was rather serious, including by virtue of the religious tradition. In this sense, our person was always less of an individualist in relation to the means of production, in relation to his property than, say, the European. Everything around is communal or kolkhoz-owned, that is, mine. There were minuses and there were pluses in that. But now that we chose a market economy as our model, we must reach a situation where private property enjoys absolute respect and protection. We understand that respect for private property is the central element in the program of any party in the West, both right, center, or socialist. In this country, it is not quite so thus far. Though, on the other hand, the majority of political parties – serious parties, not marginal ones – are putting market economy values at the base of their economic programs. There is unanimity on this matter. It is only after this that some or other differences begin. This is why concern for private property is emerging as a crucial task for any political force. Medvedev is obviously historically-minded, in the sense that he is unable to perceive current basic problems outside of the difficult – and undemocratic – history of our State. Possibly this is the consequence of his serious academic training. Moreover, he produces the impression of being a person that from the start wholly trusted the power of education. First, importantly, because he was interested in what he was doing. Second, because it is a career. By official Soviet standards, career is more likely a negative notion. For Medvedev, career is the right thing. Originally, in his student years Medvedev saw a university career as more preferable. The university traditions, in a wide sense, were always democratic in nature in pre-revolution Russia. The Soviet university school, in the person of its best representatives, sought as a matter of principle to maintain the traditions (as far as it was possible) and to pass them down the line. The traditions were based on freedom of discussion, respect for dissenting opinion, and a possibility of debate regardless of rank and title. Medvedev had a teacher who was undoubtedly devoted to those traditions. Academician Tolstoy, a pupil of the legendary Academician Venediktov, who was brought up at St. Petersburg University even before 1917. Q.: I want to ask you a question that I must ask anyway because I’d be misunderstood if I failed to ask it although it might be perceived as opportunistic. The question is about your interaction with Vladimir Putin. It’s a natural question. Putin is the current incumbent, you are his high-ranking colleague. But now the mirror-image situation is taking shape. You are President, Putin, if he becomes Prime Minister, is your high-ranking colleague. This inevitably involves certain psychological difficulties even in the most ideal relationships, and there are considerable apprehensions that this might involve some practical difficulties. What is your position on this matter? D. MEDVEDEV: For us it’s a new situation. Absolutely correct! I see many positive things in it. I am not speaking about the Putin figure and the Medvedev figure. It’s a separate story, and I am sure that everything will be OK. It is guaranteed by our personal comradely relations. But if we speak about the model, it is fundamentally new for our country. In Russian history, a head of state, no matter what he was called, had never stepped down and accepted an inferior position. A second one, a third, a fifth… Either he retired on a pension or faced disgrace. But it is not so in all other countries, at least European. In America, the tradition is different, of course. Former U.S. presidents can later run foundations or even engage in business but they cannot join the civil service again. But we are a European country, and here the practice is wide-ranging. People can go from job to job and don’t see it as a doomsday situation. This, to my mind, is a very important tradition. When a person holds the top position and later returns to active politics, to a leading position, being an efficient person and, if we mean Vladimir Putin, a super-popular leader as well. In the final analysis, this is how the true wish to serve one’s homeland is displayed. This is why I believe that this is not bad by far. It’s just that we are becoming more civilised. As far as the apprehensions are concerned, they existed, of course, and will continue to exist. All new power constructions will demonstrate their efficiency only some time later. In my view, it is a workable model. In President Putin’s view, it is the same. It will be exposed to a strength test. It’s clear. I am sure that there are people who will perceive this construction (President and PM. – RG) in their own way, who will look for inner defects, who will do what is usual in politics, to wit, foment political divisions. But we are sufficiently grown-up guys for that. We’ll cope. We continue talking with Medvedev to music. D. MEDVEDEV: “Lalena”, Deep Purple. A fantastic thing! Q: You have mentioned legal nihilism. How do we fight legal nihilism? D. MEDVEDEV: Legal nihilism and defiance of law are very hard to fight. First, we actually never quite got down to that. Second, there has not been a time in Russia’s history when legal nihilism leaves room to unconditional respect for law – that reverent respect that we can observe in many developed countries. There was nothing like that in pre-Peter the Great times, during his reign, and ever after that. The best remedy from defiance of law is decades of free life with a normal legal system. There’s hardly anything to add to that. When one realises that observing law is more beneficial than breaking it – this is the vaccination for legal nihilism. We know the peculiar traits of our national character. We are not a law-abiding nation, it’s true. And it shows in a whole number of daily habits. We have that on the highest levels as well. We are all legal nihilists to the marrow. Our value systems are often warped since our very birth. It was warped during the Soviet time as well, although Soviet people were more law-abiding in general. That was achieved through ideology and fear. People had a lot to lose: the Party membership, freedom, and often life. Today, there are none of those fears anymore, so motivation to observe law should be different today. A couple of decades of living under the rule of law, and the level of legal nihilism will fall. Q: In Russia, where the state has always been very powerful, it’s strange to see this legal nihilism. D. MEDVEDEV: You are very right in pointing that out. Russia has always been a strong, all-in-one-fist, one-country-one-party, shoot-all-traitors state. It’s amazing how it all goes together: the paternalism, the love of the state, and total negligence to norms dictated by that state. That subject is good for many a doctoral thesis on the state and law theory. We realise, after all, that the phenomena of state and law are interconnected yet rather isolated from each other. Let me provide an example. There have been numerous discussions as to the Nazi state and its law. Did it issue norms of law or not? Yes, the Nazi state was a totalitarian state, which perpetrated crimes, and so did many of its citizens. The question, however, is whether it produced any norms of law? After all, what is law? Is it merely a set of rules of behavior or is it the written form of justice, the ratio scripta? Obviously, from today’s positions, we can’t recognize the norms issued by the Nazi state as norms of law, although those are the rules of behavior that the entire Germany was living by at that time. The same applies to all totalitarian states. Thus, the essential aspects of law are not only its shell or its formal appearance, but also the true meaning of the norms included in a legal norm, their humaneness and morality. We may have a strong state yet a very weak legal system. One doesn’t automatically entail the other, because otherwise, totalitarian states would have the best legal system in the world. But the strength of a state does not automatically result in a developed law and high legal consciousness. Thus, it doesn’t eradicate legal nihilism. All that said, Medvedev has been exposed to the enormous challenge and temptation called “publicity”. Medvedev seems interested to talk about his publicity. Publicity gives him fresh emotions, which he realises and acknowledges. He habitually tries to analyse his feelings. QUESTION: Have you felt a taste for publicity? D. MEDVEDEV: I have asked this question to myself many times. I think I’d put it this way: I don’t feel that I have become addicted to publicity like a drug. There is the kind of politicians that are known as ‘political animals’. I definitely don’t feel the same about myself yet. Well, I may be Medvedev, but I’m not an animal yet, that’s for sure. It is not my physiological need to appear on screen. At the same time, certain changes have clearly taken place. Otherwise, I wouldn’t be able to do what I do now. There was a moment when I felt that it’s not difficult anymore. At first, it was annoying. I couldn’t help thinking that I could do the things I did more efficiently and quickly without all those people snapping away around me. That is, 95% of things I have done could have been done non-publicly. Such are the laws of the political genre, though. The country must know about what the authorities are doing. We are not the ones who invented that and we are not the ones to change that. Maybe it’s only right. That doesn’t annoy me anymore, which is a big step ahead. Q: That doesn’t get you high? D. MEDVEDEV: It doesn’t, but I do get a certain rush out of it. It’s easier for me to act within the genre now, that’s for sure. The question of Medvedev’s publicity and his future image is by no means idle. In Russia, Medvedev is the first President who is not a first-generation member of the intelligentsia. The country has had no such experience before, which bodes certain psychological problems both for voters who massively supported Medvedev, and to Medvedev himself. In this situation, this is evident: a correction of his image, attempts to simplify it, and outside populism are dangerous. A country is like a woman: it immediately feels any awkwardness, any falsehood, and never forgives it. On the other hand, new characteristics of the man that the country elected its President, may lend new colours to the country’s usual love-or-hate attitude towards its first person. That’s if the country wants it. Medvedev, however, will likely be able to simplify the task for the country, since besides academic education, he possesses political experience that has been growing since the 90s. D. MEDVEDEV: By 1999, my track record featured teaching and scientific work on the one hand and business on the other hand. By the way, a President with an entrepreneurial past is also something new for the country. The last man in the country’s government to have done business in the past was Kosygin. In his NEP (New Economic Policy) past, USSR Prime Minister Kosygin was in the gold mining business, with great success. Not least because of that, Kosygin knew a lot about economics and attempted an economic reform right before the stagnation. The Soviet regime, however, was taking no reforms and preferred to die instead. 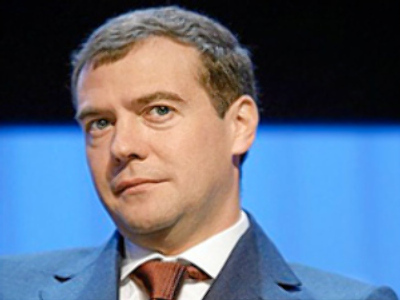 D. MEDVEDEV: Being intelligent and discreet people, you didn’t ask me how well-off I am. I can’t tell you that,. When I was leaving St. Petersburg, I considered myself rather well off by that time’s standards. QUESTION: Was that Putin calling? D. MEDVEDEV: I got a call from Igor Sechin, who told me Vladimir Vladimirovich wanted a word with me. I said, “All right, I’ll come over.” That was Saturday and he was tired after some visits. We talked and he suggested that I head the Federal Commission on Equity Markets. I had been looking at that from the scientific standpoint and I even had had some practice in the field. I wasn’t a stockbroker, I was just interested. I had even contemplated a doctoral thesis on an equities-related subject. I said I was interested but took several days to think. I came back to St. Petersburg, consulted with my family, and agreed. I went back to Moscow one month later to take the position of deputy head of the presidential staff. The head of staff then was Dima Kozak, and we agreed that I’d work for a month or so to get the idea of a state official’s life, and then I’d be appointed to the position. The events unfolded very quickly, though. Vladimir Vladimirovich said, “Look, I can appoint you head of the Equities Market Commission right away if you want, or you can stay here in the government”. I saw the job in the equities commission as interesting work in a huge, rapidly growing market, with lots of interesting issues to tackle. And the presidential staff seemed a nomenclature job to which I had never aspired and which I had considered boring. But, in a twinge of intuition or I don’t know what, I said, “I’ll stay here and help”. He said, “All right, I understand”. That was December 29, 1999. On December 31, he, already the Acting President, signed a decree to appoint me to the office of Deputy Head of Presidential Staff. I found out about that in St. Petersburg, to where I had gone to celebrate New Year. QUESTION: Yes, a young guy from St. Petersburg, from Sobchak’s old team, and rumoured to be the next Head of Staff. That was the beginning of very interesting work, work in the campaign headquarters, which I was the head of. I enjoyed that work immensely. I enjoyed being engaged in a key political process and knowing that a lot depends on me as a working unit. It was a stress test of a kind. QUESTION: Dmitry Anatolyevich, what can you say about today’s role of law enforcement authorities and secret services in the country? I mean the degree of influence of special services or people from power ministers, something that is known in the media as the influence of the power wing. D. MEDVEDEV: In my opinion, people coming from secret services have certain experience, both positive and negative. They are people just like everybody else, and they should be neither demonised nor idolised. It so happens that sometimes there are more of them in power and sometimes fewer. Usually, this is not due to some social demand for secret service people in the government; it happens by chance. If people with a previous record in secret services come to power, they often invite people with similar track record to key political offices. Those are people they previously worked with, so no surprise there. Can they contribute to the state management system in any way? Yes they can. On the one hand, such people are well acquainted with the decision making mechanism and experienced in working in secrecy, and that’s good. There are certain problems as well, though. Ex-secret service people often lack experience working in public, which is essential. I, for one, haven’t worked in any special service, yet I was just telling you that I had problems going public. And given the fact that I wasn’t just a civilian, but also a long-time lawyer! Corny as it sounds, everything depends on the person. There is no typical situation. There are lots of examples when people get excellent academic education and not work in any special services, yet turn into utter scoundrels while running a business or working in civil service. On the other hand, I know many cases of people serving in special services for most of their lives and then thriving in public politics, business, or even becoming priests. That only depends on the personality. That is why I am perfectly at ease with the fact that today, more government positions are occupied by ex-secret service people than before. We are not alone in that, after all. Look at our counterparts in other countries: many politicians there have experience of managing special services and working in them. That doesn’t annoy anyone. The matter here is that Russia’s history has been very complicated, and the public attitude towards secret services has been very different. That annoys people sure, but that’s history already. Text courtesy ofAmphora publishing house.